This page is following the Blogging 101: Make a New Page assignment. Revisions will follow after the post has time to sit and simmer. In one sense this also fulfills the requirement for My Personality on the Page. With that as a background, can you imagine just how much time I spent planning and organizing this quilt for my son and his wife? I have been years in the process. It is mostly finished, and I wanted to share it with you today. 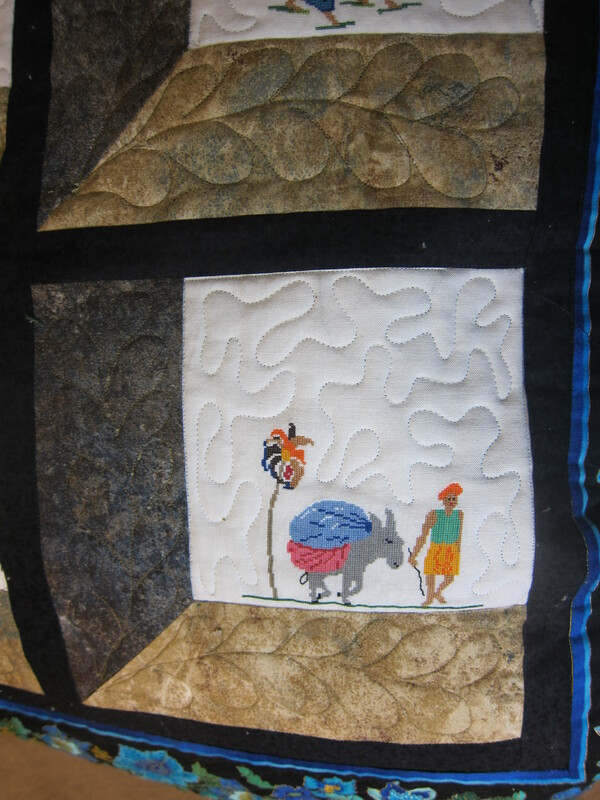 Putting on the first border was the last step before adding the drop-down borders to make the quilt fit the bed. The “windows” are tiny cross stitched pictures of Indian daily life done on linen–all memories from the time of poverty in the development of the nation. Black sashing represents the iron bars which cover every opening, thus preventing thieves from entering windows or doors. Readers should know this story about our son before we move on. I first thought of calling the quilt Seraglio Windows. Even though the verse below seems to fit, I certainly do not want to call it Prison Windows. The theme idea is that someone is on the inside looking out upon the spectacular world where our son was born and grew up. Border cloth was chosen to approximate the appearance of the houses, the little cement fortresses found in most Indian architecture. The fabric line is Stonehenge but has no relationship to the place in England. 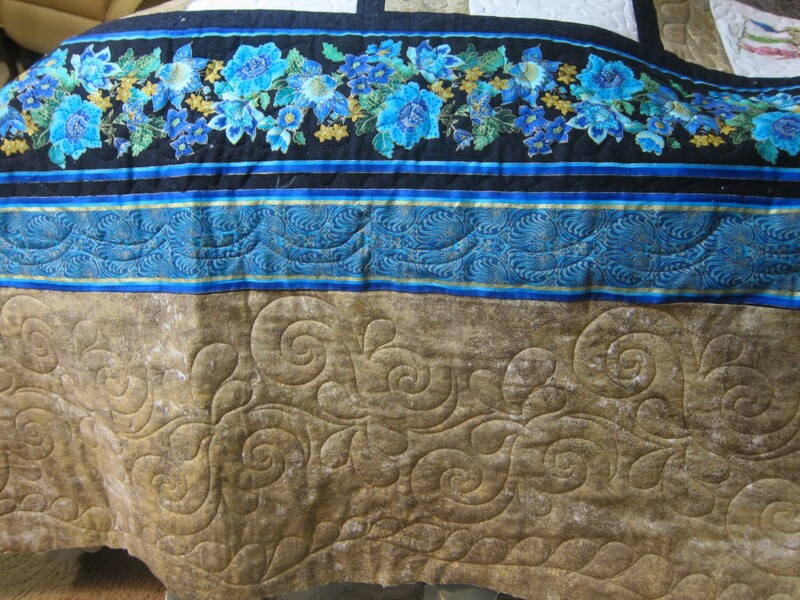 Finally, the pillow shams are extensions of the whole quilt–just a smaller version. 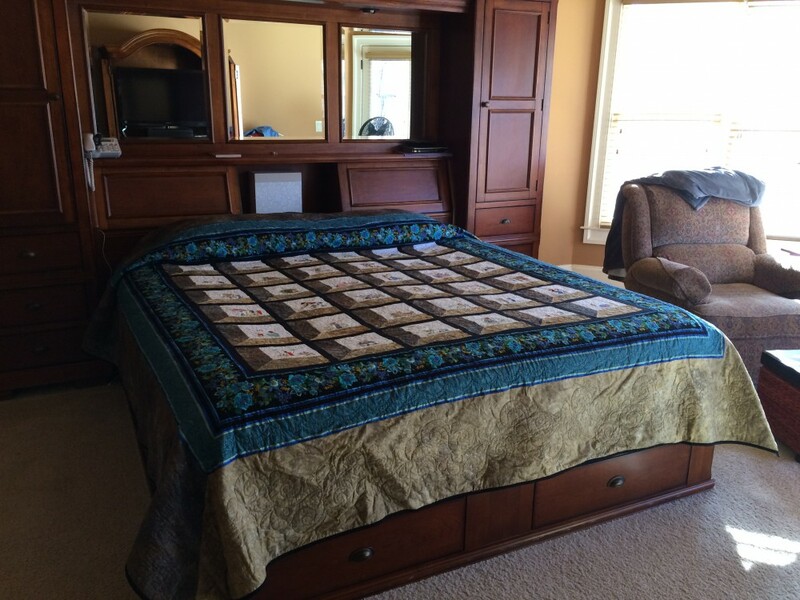 My daughter-in-law, Becky, sent these pictures of the quilt on their bed. Just try to sew on a binding when a cat is around. You will find you are wasting your time trying to chase him away! 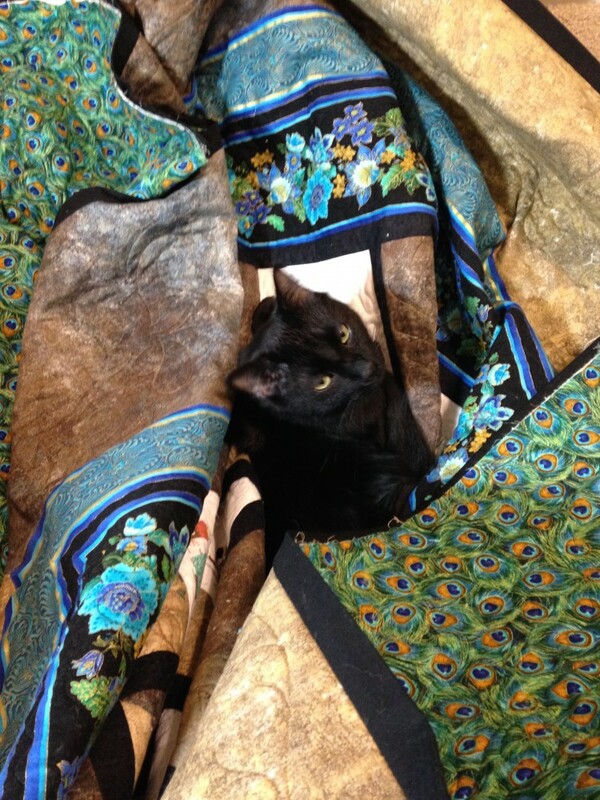 What is it about cats and quilts? I can’t possibly forget this unfinished beauty! This is the pillow meant to draw the quilt front and back together. AND a little bit more of the same regal bird. And one more for detail. What a work of art! 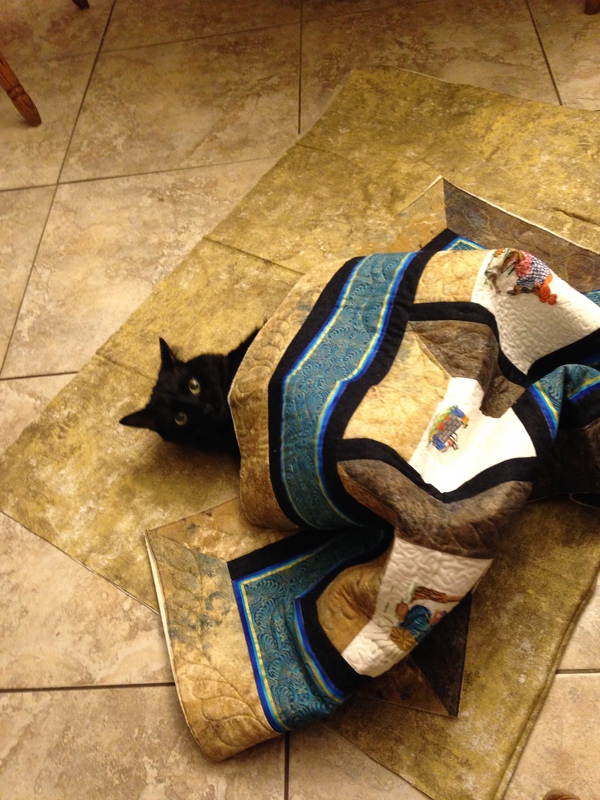 I love the quilt you made. I know what hard work quilting is. I have made several, all hand pieced and hand quilted. Your work is beautiful. Thanks for dropping by and for poking around to see what all I have included. You might search the word crochet and see another aspect of my life. So much to do and so little time… I hope to post other such things as time goes on. Kate, what I would really like to do is write a story about it that would tell what all the picture are for and about. What a wonderful idea. I hope you do it! 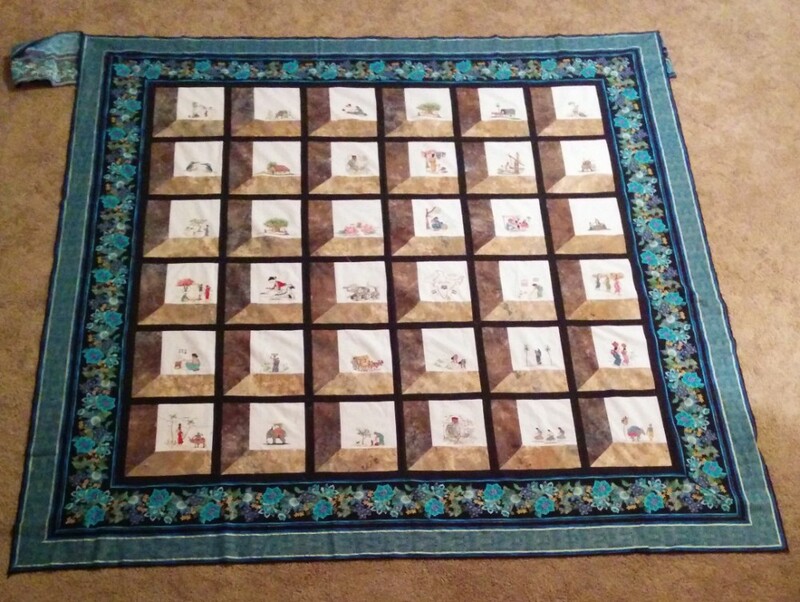 I used to do a lot of baby quilts so I have some idea how hard that was. The little windows are fascinating. What a labor of love. And it looks so beautiful on the bed. You’re a true artist. I did a lot of research before I started this project. It has taken a very long time to finish. Absolutely gorgeous!! Many hours of work in it, I’m sure. More years than I want to admit, but the hours and years were well spent when I think of all this represents. I am floored (a pun, if you caught my last post The Floor I Couldn’t Reach). The quilt belongs in an exhibit. And yes, it absolutely speaks of your personality as well as your values and insistence upon organization and clarity, and your longing to tell stories. Simply amazing. There are times when my dreams are more like nightmares, but I couldn’t let this dream go for some reason. I have another dream brewing. This time it will be for my youngest daughter and her husband–done in rainbow shades of batik. She loves color and the more color the better. Wonderful. Your children and their loves ones are so blessed. What an amazing piece of work! 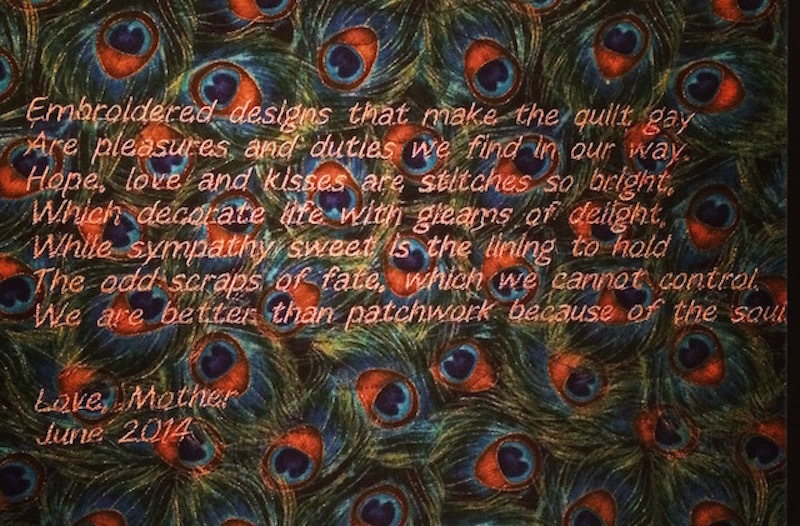 I have loved every quilt every made for me by a grandmother or my mother. Such a wonderful gift. Thanks! And I do hope you find other things you like here. Did you check out the apple butter letter? Sarah, I have not met you yet, but I certainly appreciate that you took time to comment on this page. Thanks and let me go find out what you do and what you write about. Simply Beautiful. What talent and dedication to perfection you have. 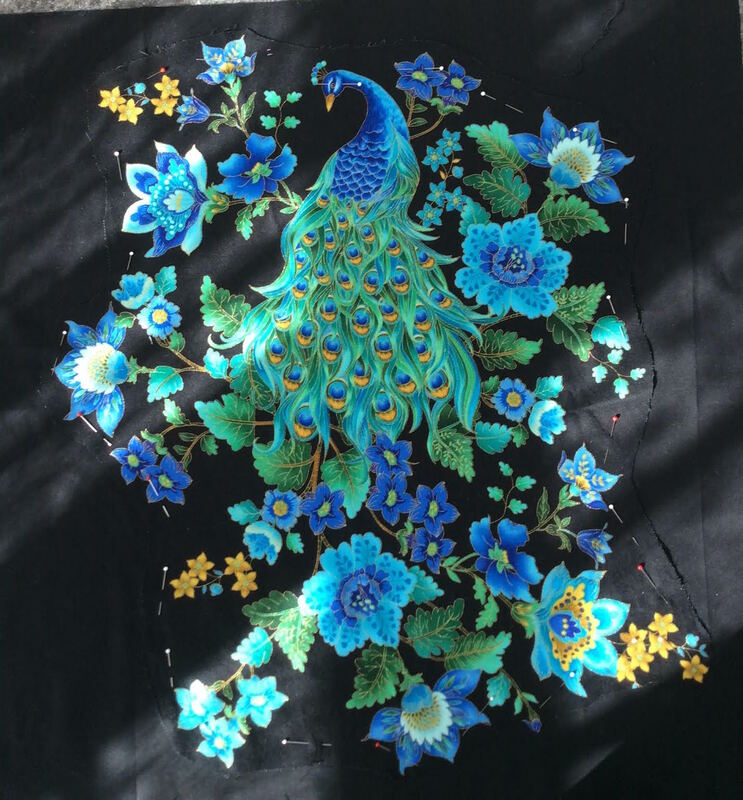 I have always wanted to learn to quilt; however, I’ve yet to stop to make the time to learn. Someday, I’d like to make that “stop.” Thank you for sharing. Quilting is an art I have not mastered, but I appreciate being able to share what few I have finished. As the blog begins to grow, I hope to share more of the crafty items that will encourage others to try their own skills. We are here for each other. 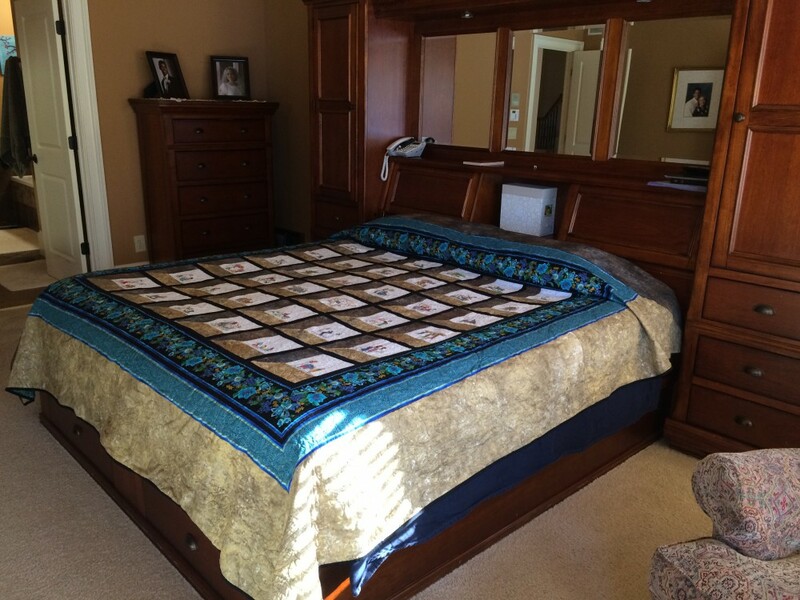 Wow, that’s a serious quilt! It isn’t quite what I had envisioned, but it has potential to tell the story. I hope you were able to use the magnifying software at the bottom of the page I linked to. That shows the little cross stitched pictures plainly. And the pictures of our son were there as well. This quilt is rich in so many ways–in beauty, in hours invested, in its representation of life in India, both past and present. 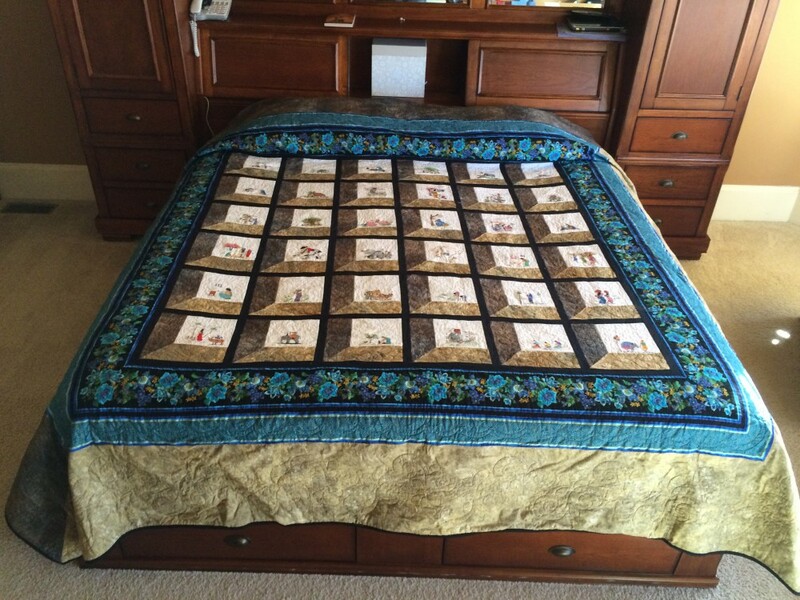 Thank you for sharing both the quilt and Matthew’s story (via the link) with us, Beth.